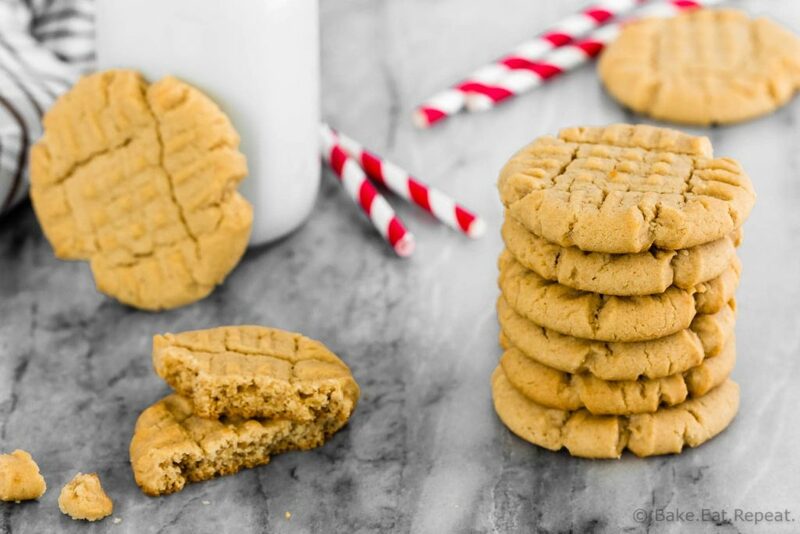 These classic peanut butter cookies are a bit crisp and crumbly, full of peanut butter flavour, and super easy to make. They have that classic cross hatch pattern on top, and are the perfect snack or dessert! They might even win against chocolate chip cookies, which is a little weird. Usually I go for anything chocolate first, but peanut butter cookies? They are just the best. It’s pretty clear that we’re peanut butter fans around here. 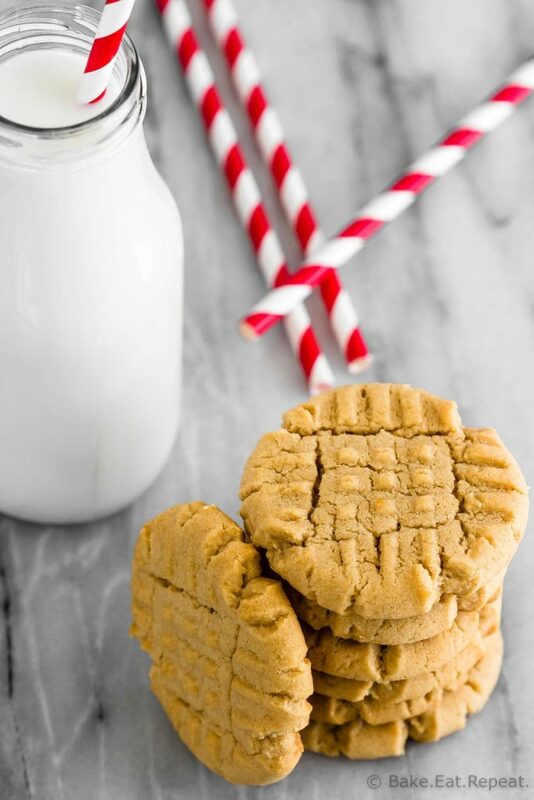 So many peanut buttery recipes on this site! 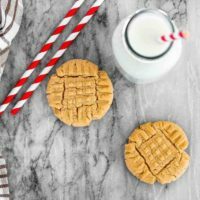 These chewy 3 ingredient peanut butter cookies are amazing, and so easy to make. These peanut butter energy balls are like a no bake peanut butter oatmeal cookie and are perfect for a quick energy filled snack. These oatmeal peanut butter bars taste a bit like a monster cookie, but are actually fairly healthy. And….I could go on. So many peanut butter recipes and really, they’re all good. The trick is deciding which to make when you’re hankering after a peanut buttery snack! But these particular peanut butter cookies? They’re pretty amazing too. 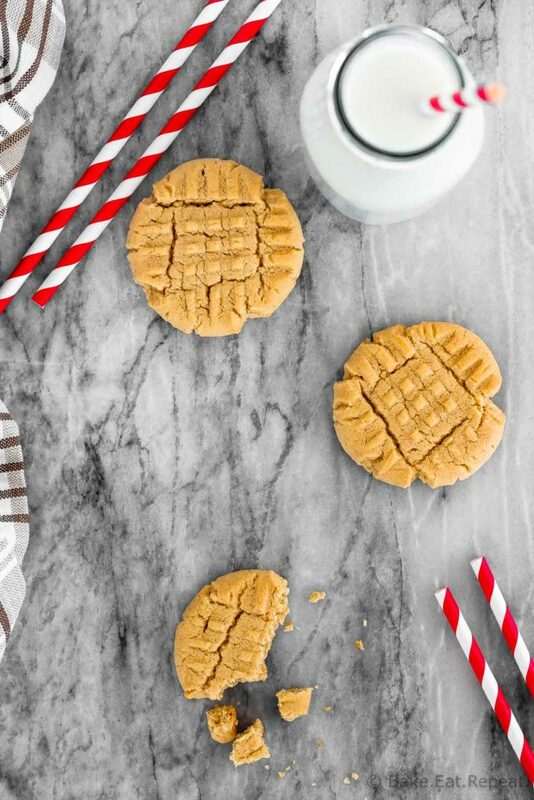 It’s a classic peanut butter cookie (with the cross hatch pattern on top that peanut butter cookies just need to have) that is a bit crisp, a bit crumbly, and basically reminds me of the peanut butter cookies my mom used to make when I was a kid. In fact, they probably are the peanut butter cookies that my mom used to make, since I found this recipe stashed in her old recipe binder. I remember as a kid coming in the door after school and immediately smelling these cookies if she had made them that day. That always made for the best after school snack! 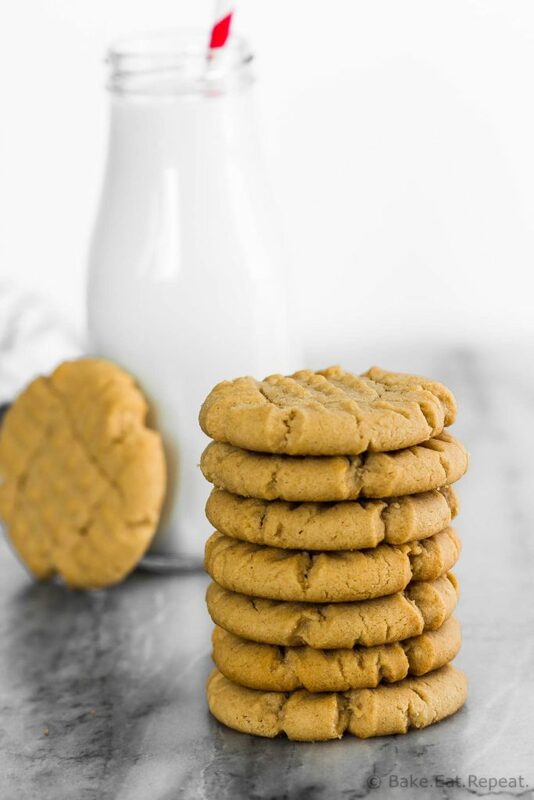 My kids agree – these cookies are pretty fantastic – and perfect for those after school munchies! 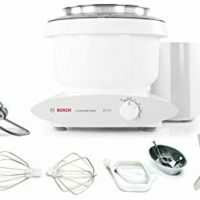 In the bowl of a stand mixer, or in a large bowl with an electric mixer, cream the butter, brown sugar and granulated sugar until light and fluffy. Add the flour, salt and baking soda and mix until well combined. Form the dough into tablespoon sized balls and place two inches apart on the prepared baking sheets. Press down to about a half inch thick with a fork, making the classic cross hatch pattern with it. Bake the cookies for 8-10 minutes, then let them cool on the cookie sheet for 5 minutes before removing them to a wire rack to cool completely. Source: Slightly adapted from an old Chipits recipe I found in my mom’s recipe binder. I’m not much of a cookie baker, but I now have some little grand kiddos. So I see cookie baking in my future! Thanks for reminding me of wonderful peanut butter cookies! 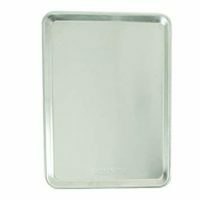 I usually use these baking sheets - they're reusable and I love them. 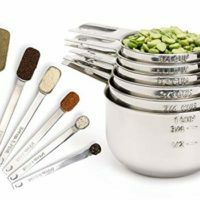 Parchment paper or a silicone baking mat will work as well. Or you can just lightly grease the cookie sheet if you prefer.